The Hankook Tire Spring Rebate is offered on purchases of a set of 4 tires from patterns listed below between March 15th and May 31St, 2019. Fleet or Warranty replacement purchases are not eligible for the rebate. All rebate claims and supporting documents must carry a postmark or equivalent no later than 11:59:59 PM, June 30th, 2019 or claims will be declared void. Hankook Tire Canada Corp. and its Rebate Processing Center are not responsible for lost, damaged, postage due or misdirected mail. 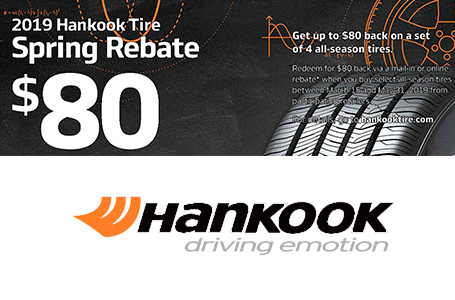 If all rebate conditions are met, your Hankook Tire Rebate Prepaid Mastercard®1 will be mailed to your mailing address approximately in eight (8) to ten (10) weeks upon receipt of a valid completed claim form. 1 Prepaid reward card is issued in connection with a loyalty, award or promotion program. This card is issued by Peoples Trust Company under license from Mastercard International. Mastercard is a registered trademark, and the circles design is a trademark of Mastercard International Incorporated. No cash access or recurring payments. Card valid for up to 12 months; unused funds will forfeit after the valid thru date. Card terms and conditions apply.